ACS Mould Wash Concentrate Fungicidal Cleaner is a concentrated fungicide and surface biocide for amateur and professional use. Mould Wash Concentrate is use against mould fungi, mildew and algae on internal and external surfaces such as masonry, patios, tiles, wood and painted surfaces. 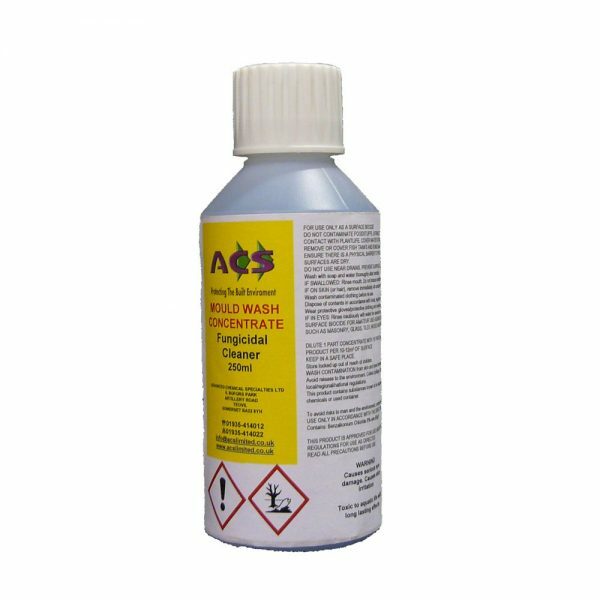 The 250 ml concentrate will dilute to make 5 litres of mould control wash which will cover approximately 50-60 m². Please read all instructions before use. Prepare surfaces by removing non-washable and loose material, e.g. flaking paint, grease, dirt, mould or wallpaper. Make good any surface defects and rub down to a smooth finish. Dilute 1 part ACS Mould Wash Concentrate with 19 parts water. Wash down the prepared area with the diluted ACS Mould Wash Concentrate using a sponge, scrubbing brush or cloth. Allow to dry thoroughly. Apply second wash in badly soiled areas and allow to dry. Drying Time: 1- 4 hours normally. Practical Coverage: 10 – 12 m²/litre when diluted depending on the porosity and roughness of the surface. Application: By sponge, cloth or brush. Uses Decking, garden furniture, stone patios and paths Masonry, tiles, wood and painted surfaces. Mainly a pre-wash treatment. Added to paints, grouts and wallpaper paste following pre-treatment with ACS Mould Wash concentrate.